There was "no need to impose tariffs where there are none now"
EU chief Brexit negotiator Michel Barnier described the speech as "constructive"
He said the prime minister had shown "a willingness to move forward"
Labour leader Jeremy Corbyn said the speech suggested the PM had faced up to the reality "that Britain needs a transition to provide stability for businesses and workers"
But former UKIP leader Nigel Farage said: "Theresa May's vision is that we leave the European Union but we do it in name only." Irish foreign affairs minister Simon Coveney hailed Theresa May's speech as "a positive contribution" towards making progress on citizens’ rights, the financial settlement and Irish issues. But he said it was clear "a lot of work is still required before European leaders can make a decision that parallel discussions on the EU’s future relationship with the UK can begin". "At times our need for a sympathetic gesture is so great, we care not what exactly it signifies or how much we have to pay afterwards." Forgive the delving into my fifth year English homework. (Before you ask: EM Forster, A Room with a View, the homework was rather a long time ago.) But, when someone has said it better before, why try to say it again? Theresa May's speech is indeed, above all else, an attempt at a "sympathetic gesture", an admission that the UK government is willing to pay tens of billions of taxpayers' cash to the EU over the next couple of years, and acknowledgement that there will have to be a limited, but extended period of time - a transition period - where the relationship between the UK and the EU might not actually change very much. It is an offer, not a blinding revelation, but a limited flash of ankle to her continental counterparts. Scotland's Brexit Minister and SNP veteran Michael Russell described Theresa May's speech as "short on detail", but her acceptance of a transition period within the single market, with freedom of movement, "shows the UK government has changed its position". Quote Message: That is due to the growing consensus of opinion - including leading business voices - that leaving the world's biggest single market is potentially disastrous for jobs, investment and living standards." That is due to the growing consensus of opinion - including leading business voices - that leaving the world's biggest single market is potentially disastrous for jobs, investment and living standards." But Mr Russell added that the PM now needs to go further and "commit to a long-term future in the single market and customs union, not just as a transition arrangement". Ruth Davidson, leader of the Scottish Conservative Party, says the prime minister's speech included a lot "for both leavers and remainers". Giving her reaction to Mrs May's vision for Brexit negotiations, she said: "Crucially we will be leaving the European Union, this is not an open ended transition," adding: "Also we are looking for a bespoke deal. We are not a Canada and we are not a Norway, we are looking for a British deal." Will we see the difference post-Brexit? The proposed transition period post-Brexit "will protect jobs and investment on both sides of the Channel", CBI director-general Carolyn Fairbairn has said. Hailing the PM's "positive tone", she said: “Firms will welcome the proposal of a ‘status quo’ transition period for business that averts a cliff-edge exit." Quote Message: Negotiators must now move the talks on to trade and transition as soon as possible. More tough choices and compromises await and listening to firms will help ensure agreement on a comprehensive version of what our future economic relationship with the EU will look like." Negotiators must now move the talks on to trade and transition as soon as possible. More tough choices and compromises await and listening to firms will help ensure agreement on a comprehensive version of what our future economic relationship with the EU will look like." Conservative former business minister Anna Soubry has welcomed Theresa May's speech, saying it was "absolutely the right step and the right direction". The pro-EU MP claims the Florence address put the interests of the economy and jobs "at the heart of Brexit". "It will give British business some sort of certainty," she tells the BBC, although "they need a bit more flesh on the bones". Will EU negotiators cut May some slack? BBC assistant political editor Norman Smith said Theresa May's speech was warm, conciliatory and spoke of an exciting future for the UK and EU. He said EU negotiators that were listening might think they can "cut Mrs May some slack" and allow the UK to move to the second phase of Brexit negotiations. But he warned there may not be enough yet on the rights of EU nationals to allow the talks to move ahead. He added that Mrs May had gone out of her way to appeal to EU leaders, and if they were listening, they might "put the squeeze" on EU chief negotiator Michel Barnier. What did we learn from May's Florence speech? 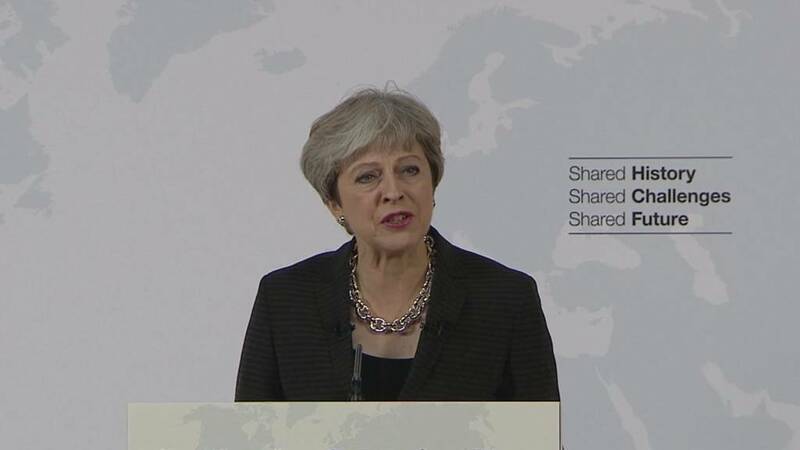 Prime Minister Theresa May has used a speech in Florence to set out the UK's position on how to move Brexit talks forward. With further negotiations planned next week, what did her speech tell us about the sort of Brexit deal we might end up with? Reality Check correspondent Chris Morris has been scanning the speech. In his statement, Brexit chief negotiator Michel Barnier also said the EU "shares the goal of establishing an ambitious partnership for the future". Quote Message: The fact that the government of the United Kingdom recognises that leaving the European Union means that it cannot keep all the benefits of membership with fewer obligations than the other member states is welcome. In any case, the future relationship will need to be based on a balance of rights and obligations. It will need to respect the integrity of the Union's legal order and the autonomy of its decision-making." The fact that the government of the United Kingdom recognises that leaving the European Union means that it cannot keep all the benefits of membership with fewer obligations than the other member states is welcome. In any case, the future relationship will need to be based on a balance of rights and obligations. It will need to respect the integrity of the Union's legal order and the autonomy of its decision-making." Conservative former chancellor Ken Clarke, a staunch Europhile, says British business "will be considerably reassured" by Theresa May's speech in Florence. The PM outlined how "we're going to stay in the single market and customs union for at least the next two years", he said, commenting that Mrs May had not been playing to any particular gallery in the UK. He added: "The fact is we're going to have no new barriers... we're going to continue under our present rules." Manfred Weber, who chairs the centre-right European People's Party in the European Parliament, has tweeted that the Florence speech has left him "even more concerned". Guy Lougher, partner at law firm Pinsent Masons, says the issue of the Irish border remains outstanding following the Florence speech. "The three key issues are the rights of EU citizens in the UK post-Brexit, the size of the UK’s exit bill, and Ireland," he says. "The speech covers two of the three key issues.... However, the prime minister’s speech does not contain any concessions on Ireland, which is the third key filter issue identified by the EU." He argues: "It is possible that the EU maintains its view that there has not been enough ground conceded by the UK to justify moving negotiations into the second phase, because the prime minister’s speech contains no new policy initiatives in relation to the thorny question of Ireland." Europe's chief Brexit negotiator Michel Barnier says Theresa May's speech "shows a willingness to move forward" on Brexit. But he stresses that the EU's priority is "to protect the rights" of EU citizens living in the UK in the same way as the rights of British citizens are protected in the EU. While the UK recognises none of the remaining 27 members of the bloc will have to pay more or receive less because of Brexit, "we stand ready to discuss the concrete implications of this pledge", he said. Mr Barnier said the UK's request to continue to benefit from the single market during the two-year transitional period "could be taken into account by the EU". Quote Message: The sooner we reach an agreement on the principles of the orderly withdrawal in the different areas – and on the conditions of a possible transition period requested by the United Kingdom – the sooner we will be ready to engage in a constructive discussion on our future relationship." The sooner we reach an agreement on the principles of the orderly withdrawal in the different areas – and on the conditions of a possible transition period requested by the United Kingdom – the sooner we will be ready to engage in a constructive discussion on our future relationship." Italian MEP Roberto Gualtieri, who chairs the European Parliament's economic and monetary affairs committee, describes Theresa May's speech as "interesting". He would like to know whether the UK PM is committing to a longer-term "financial framework" or a "yearly budget" for financial contributions to the EU during the proposed transition period. He says he doesn't know whether Mrs May's words will be enough to move Brexit talks forward, but more "concrete" proposals from the UK might.